Furniture Sox - Floor Protection [Furniture Sox - Floor Protection] - $13.99 : NewDaVincis.com!, Great Innovative Products, Gadgets and more. Protect Hardwood, Bamboo, Laminate and Tile. protection for all of your scratchable floor surfaces. Enough Sox for 4 chairs, tables or barstools. Furniture Sox come in one size. One size fits most furniture legs. A smart, stylish, practical cotton design that provides protection for all of your scratchable floor surfaces. The Furniture SoxÂ® currently come in 3 fashionable colors with gold trim, designed to compliment your furniture and dÃ©cor featuring a specially designed slip resistance on the inside to aid in keeping the sox in place. Furniture SoxÂ® are easy to use and machine washable. Sox can simply be placed on most furniture legs for peace of mind floor protection. We suggest that the sox be washed in a mesh bag due to their small size. The Furniture SoxÂ® can also be easily dusted off to avoid dirt and dust build-up. The current collection is made up of the stylish and practical solid colors chocolate brown, ebony black or white ivory, all with fashionable gold trim. Future collections will include new colors and artful designs. Simply replace the standard felt pad that is on your furniture legs and switch toÂ Furniture SoxÂ®. Or for added protection, Furniture SoxÂ® can be placed right over felt pads. They work well together to provide extra protection on heavy and often used furniture. At just a glance you know your scratchable floors are protected from unsightly scratches and mars. You won?t have to constantly remind your children and family to be careful with the furniture ?it will scratch the floors?. 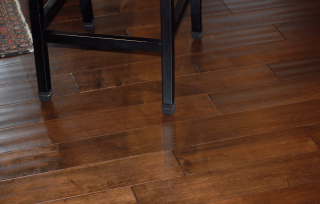 Furniture SoxÂ® are unlike all other floor protection that can come off without your even realizing it and your floors are scratched before you know it. Great for every room in the house! The Chocolate Brown Furniture SoxÂ® are designed to compliment all wood tones. It will stylishly blend with your solid wood and wood-tone furniture legs while giving you complete floor protection. The White Ivory Furniture SoxÂ® are designed to compliment all of your white, off-white, silver, metallic and contemporary furniture. The White Ivory with gold trim will stylishly blend with your lightest colored furniture legs while providing complete floor protection for your scratchable floors. The Ebony Black Furniture SoxÂ® are designed to compliment all black furniture, very dark wood tones as well as contemporary furniture. The Ebony Black with gold trim will stylishly blend with all of your black and darkest furniture legs while providing unmatched floor protection. Q:Â What shape furniture legs will Furniture Sox work on? A: Furniture Sox work on most leg shapes including square, round, rectangular, oval and bun feet. Furniture Sox are not recommended for really tapered legs. Q:Â What size furniture legs do Furniture Sox fit on? 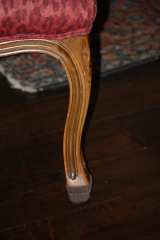 A: Because of the elasticity, Furniture Sox fit most furniture leg sizes with the exception of very small furniture legs. Extra small Furniture Sox are coming soon but currently not available. Q:Â Can Furniture Sox be cleaned? A: Yes, they are machine washable and reusable. Because of their small size it is recommended to wash them in a mesh bag and to avoid shrinkage we suggest air drying. It is recommended that you keep your Furniture Sox free of dirt and debris by occasionally dusting them off if needed. Q:Â Will Furniture Sox wear out? A: While we haven?t seen any wear out we will have to say that like socks that you wear on your feet, they will eventually wear out after time and under regular usage. So, they may need to be replaced periodically. Q:Â Will Furniture Sox slip off? A: Furniture Sox are designed with a special slip-resistance on the inside of the Sox to prevent slippage. The beauty of Furniture Sox is the fact that with just a glance, you know your floors are protected. If one were to come off then you will be able to see it and remedy the problem to prevent scratching your floors. Q:Â Will Furniture Sox protect my floors while moving heavy furniture across the room? A: No, Furniture Sox are designed to protect your floors from scratches during the everyday use of furniture such as barstools and chairs and when furniture is moved during regular cleaning and vacuuming under a table or behind a chair. We do not recommend sliding furniture across a room, it will damage your floors. Q:Â Should I replace my felt pads with Furniture Sox? A: While you can replace your felt pads with Furniture Sox, you may want to simply place the Furniture Sox over the felt pads to provide additional protection on heavy and often used furniture.